What Are 3 Functions of the Umbilical Cord? The cardiovascular system—also known as the circulatory system—is one of the most vital systems in your body. Despite this, most people's knowledge stops somewhere around "the heart pumps blood to the rest of the body." In fact, the cardiovascular system transports not only blood, but also oxygen, hormones, blood sugar, vitamins, minerals, waste and nearly everything else that is produced in one part of the body and travels elsewhere. The heart is composed mostly of muscle and nervous tissue and is divided into four chambers. The top two chambers are the atria; the bottom two are the ventricles. The left half of the heart supplies the body with oxygenated blood, and the right half helps exchange the carbon dioxide your body generates for additional oxygen. The cardiovascular system uses a series of veins and arteries to carry blood to and from the heart. Arteries are blood vessels that carry blood away from the heart, while veins are blood vessels that carry blood toward the heart. 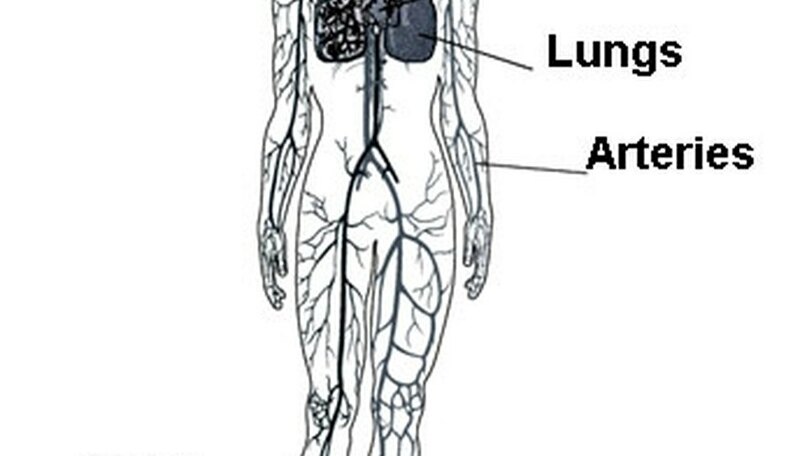 The left atrium receives newly oxygenated blood from the lungs via the pulmonary vein. The right atrium receives oxygen-poor blood back from the rest of the body via the superior and inferior venae cavae. Your heart then expels the contents of the left and right atria into the left and right ventricles, respectively. The left ventricle sends blood to the entire body via the aorta, while the right ventricle sends blood to the lungs via the pulmonary artery. The left ventricle is the largest of the heart's four chambers and the aorta is the largest blood vessel in the body. When blood exits the left ventricle, there are many branches that divide off from the aorta to supply blood throughout the body. Coronary arteries supply the outer muscle tissue of the heart with blood. As the aorta continues, the carotid arteries carry blood toward the brain and the abdominal artery carries blood toward the lower part of the body. In this area, an axillary artery branches off to each side to supply the chest with blood and a subclavian artery branches off to each side to supply each arm. From the abdominal artery, the hepatic and splenic arteries split off, supplying the liver and spleen respectively. Farther down, two renal arteries branch off to supply each kidney with blood, and the abdominal artery forks into two femoral arteries that supply each leg. All the veins in the body, with the exception of the pulmonary veins, eventually empty into either the superior or inferior venae cavae. The superior receives blood from the upper parts of the body and the inferior from the lower. Most of the names of the smaller veins mirror the names of their respective artery. For example, there are hepatic, renal, femoral and subclavian veins that return the blood from the same area as the arteries of the same name. The most notable exceptions to this nomenclature are the jugular veins, which run down the neck and return the blood supply from the brain to the heart. The blood pours into the venae cavae, which are emptied into the right atrium of the heart on the way back to the lungs, and the entire cycle repeats itself. The cardiovascular system also exchanges hormones, nutrients and waste with the individual cells of your body, a process that would be impossible if all your blood vessels were large. Each artery forks off into many arterioles, and those arterioles in turn become capillaries. A capillary is the branch between the arteries and the veins and it is at the capillary level that actual exchanges occur between the blood and the cells. Oxygen and other nutrients travel through the capillary into the cell, while carbon dioxide and other wastes leave the cell and dissolve in the blood. Each capillary then turns into a venule, which is equivalent to an arteriole. Many venules empty into larger veins on the way back to the heart. What Three Things Help Push Blood Through Veins? Williams, Matthew. "Structure of the Cardiovascular System." Sciencing, https://sciencing.com/structure-cardiovascular-system-5335651.html. 24 April 2017. What Are the Functions of the Left & Right Atria?